It’s only true love if you put all your heart into it. The glassmakers of Murano, in the Venetian lagoon, can rightly claim love for their craft. Since the eighth century, the artisans of the Venetian islands have been working the 2,700 Fahrenheit furnaces and using simple tools to make the complex glass shapes and patterns that are still the envy of the world. Other places have tried to produce patterned glass, but none possess the passion or perfection of Murano. The Cuore d’Italia Pendant was made in Murano by these committed artisans. If you have the same dedication, desire and devotion for your loved one as the Murano glassworkers have for their craft, then the Cuore d’Italia Pendant is a perfect gift to make clear how you feel. 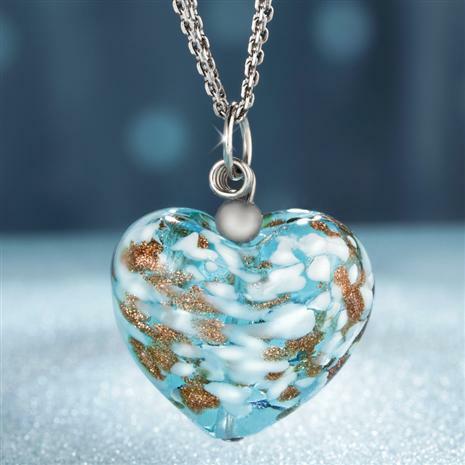 The pristine blue heart pendant pulsates with white and 24K gold leaf touches. The perfect way to say that you love her with all your heart.